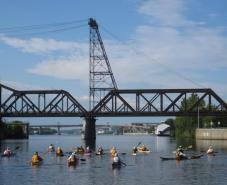 Albany, N.Y. (July 29) - The tenth annual Great Hudson River Paddle (GHRP) launched from the Corning Preserve in the City of Albany today at 9:00am. The group will continue through Thursday August 5th, 2010 arriving at Annsville Creek Paddlesport Center in Peekskill. Paddlers will be greeted at Cornell Park in New Baltimore, NY when they arrive in the afternoon. A community dinner, sponsored by the New Baltimore Conservancy will be held. Author Russell Dunn will be on hand to autograph copies of his just released book A Kayaker&apos;s Guide to New York&apos;s Capital Region. For Directions to Cornell Park, Mill Street, New Baltimore CLICK HERE. This signature Greenway event entices kayaking enthusiasts from across the country and around the world to experience the Hudson Valley&apos;s historic waterway. This event is designed for paddlers of varied skill levels and those new to paddling. The 2010 GHRP features 30 seasoned paddlers and rowers that will have the unparalleled experience of traveling under their own power over 100 miles from Albany to Peekskill, enjoying the beauty and heritage of the Hudson River and its riverside communities. They will be camping out in state and local parks along the way and visiting heritage and cultural sites in the communities in which they will be staying. 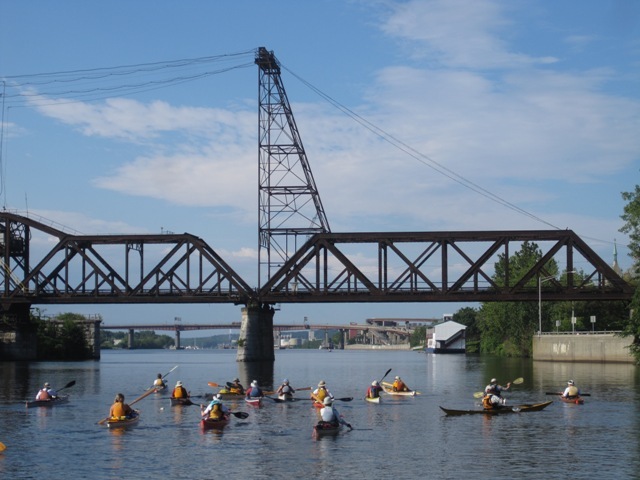 "The Great Hudson River Paddle is a terrific way to experience the beauty and heritage of our region&apos;s most important natural resource," said Congressman Paul Tonko. "It&apos;s also a showcase for communities along the river, and the efforts being made to develop the waterfront to increase tourism and economic activity. It&apos;s my hope that we can build on events such as the Great Hudson River Paddle as we embark on creation of a regional strategy for waterfront development." Mark Castiglione, Acting Executive Director of the Hudson River Valley Greenway, stated, "The Great Hudson River Paddle showcases the Hudson River as a tremendous natural resource that is also an abundant recreational resource that supports tourism and economic development. This event is an exciting and interactive way to highlight the Hudson River Greenway Water Trail, New York State&apos;s efforts to revitalize our waterfronts and the Hudson River Valley National Heritage Area. We are proud to celebrate the Hudson River by sponsoring this event along with our state and private partners for the tenth year." New York State Canal Corporation Director Carmella R. Mantello said, "The Great Hudson River Paddle is a wonderful event that highlights the creation of the Hudson River Greenway Water Trail, while bringing attention to the vibrant communities of the Hudson Valley. This event helps showcase the state and local revitalization efforts in the Hudson Valley that are being used as a model statewide, including along the New York State Canal System and the recently announced Canalway Water Trail." Author Russell Dunn noted, "What makes the Hudson River so exciting to paddle on is its unpredictability -- not only do you have wind, waves, speedboats, large barges, and the vicissitudes of weather to contend with, but the tides as well which lift and lower the river several times a day." Organizers of the eight-day trip include the Hudson River Valley Greenway, the Hudson River Valley National Heritage Area, and the Hudson River Watertrail Association. The Greenway is a state entity charged with developing the Hudson River Greenway Water Trail, and the mission of balancing economic development and regional planning with natural and cultural resource protection, environmental and heritage education, and public access to the Hudson River and other resources. The Hudson River Valley National Heritage Area is a federal program whose mission is to recognize, preserve, protect and interpret the nationally significant cultural and natural resources of the Hudson River Valley for the benefit of the Nation. The Hudson River Watertrail Association, Inc. is a coalition of human an d wind powered boaters dedicated to building a river trail from the Atlantic Ocean to Canada and promoting a low impact approach to the Hudson River. GHRP 2010 celebrates the Hudson River Greenway Water Trail, the improvement of public access to the Hudson River, and the diversity and heritage of the riverside communities. Since 1994, the Greenway has designated 93 public access sites as part of the Hudson River Greenway Water Trail, providing access to and from the Hudson River, overnight accommodations, and connections to day use attractions. As part of developing the water trail the Greenway has provided grants totaling $400,000 to 30 communities and non-profits to develop or improve sites. The Greenway has been a major funding and technical assistance sponsor of the Great Hudson River Paddle since its inception in 2001. Joining in the fun again this year is Building Bridges Building Boats, a youth boating organization. A group of young boaters, ranging in age from 12 to 18, will hit the water along with their captains to accompany the GHRP paddlers. Each day of the paddle, up to as many as 30 participants will be navigating the waters of the Hudson River together, creating an incredible sight for spectators from the shore and the river. GHRP 2010 has a number of Premier Sponsors including the New York State Bridge Authority and Hudson Valley Outfitters. Partner Sponsors include Atlantic Kayak Tours, Village of Cold Spring, Hudson River Rowing Association and Shady Harbor Marina. This event is sanctioned by the American Canoe Association.